When my older brother got married and moved out of his one-bedroom apartment in Brooklyn Heights, I moved in. That was 2006 and I was single. The apartment was in a brownstone--the top floor--three flights up what can be best described as a treacherous set of stairs. The building was charming, and so was the light-flooded apartment. Although the building didn't officially have a roof deck, I had my own Tar Beach that I accessed via a trap door. I enjoyed many a summer evening up there trying not to get too close to the mini-wall that surrounded it. Shortly after I met my future wife in 2009, she moved in with me and we stayed happily for two years. But eventually those treacherous stairs lost their charm and we wanted more space, more amenities and we were ready to buy. We looked in Brooklyn Heights but couldn't find what we were looking for. We were craving something new and modern, with a doorman, an elevator, a gym. We found what we wanted in the Clock Tower building in DUMBO: a one-bedroom loft-like space with all the extras we hoped for, plus a washer and dryer right in our apartment. 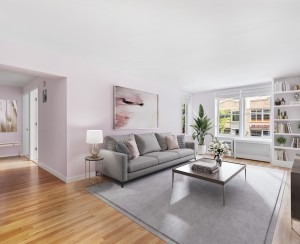 While the apartment is cheaper than a similar place in, say, the West Village or SoHo, DUMBO is probably as expensive as most other Manhattan neighborhoods. And it's very different from Brooklyn Heights. Brooklyn Heights was very much a neighborhood. We had our favorite coffee shop, the Promenade, a cluster of shops on Montague Street—all lively, safe, cobble-stoned and low-rise. 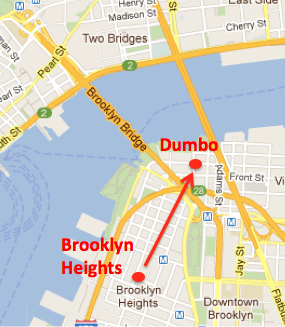 In comparison, DUMBO feels like Gotham City. It's industrial, quiet, cool (without feeling too deserted at night). Not many families out on the street, hipsters instead. Food shopping in Brooklyn Heights was easy. Now we have only bodegas and a super expensive mini market where we can get fresh vegetables. The solution: we've just become proud new customers of Fresh Direct (which also means we've become expert meal-planners). We have a spectacular waterfront right in front of our building. We've got Brooklyn Bridge Park and Jane's Carousel, originally built in 1922 and transported to our front yard from Youngstown, Ohio. We may not have a lot of strollers in the 'hood but we have lots of the kids from Brooklyn Heights commuting via stroller to ride our carousel. I still ride my bike to work in downtown Manhattan. I am just as close as I used to be in the Heights -- I just have to take a slightly different route to the Bridge. 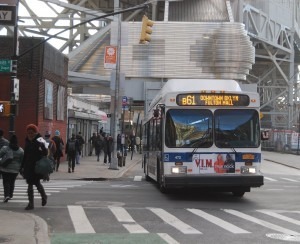 When we lived in the Heights, the walk to the 2 or 3 train was 5 minutes, now it's 8; the F train is around the corner. My wife walks to work. Neighbors are friendly and the night life is better here than in Brooklyn Heights—there's a little more trouble to get into here. The shops are cooler, less vanilla than the Heights. We never want to leave here if we can help it. Some day we'd like a larger apartment in this same building but we've definitely found the place we want to be.